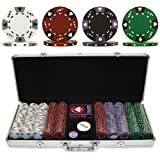 chip | Buy Poker Chips Sets at the best prices! These 500 Chips are 39 mm diameter casino sized chips and are 11.5 grams in weight. They are produced from a composite resin and an insert that gives them the weight feel of a heavy casino quality chip. The detail on these chips is great. The card suits around the chip as well as the detail spots on the edge of the chip add to the great appearance. 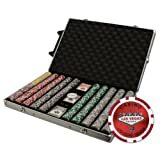 This 1,000 Count Las Vegas Poker Chip Set in a rolling aluminum case is perfect for cash or tournament games. Each Las Vegas chip weighs 14 grams and is made with clay composite materials. Featuring sparkling laser-graphic inlays, these chips are sure to impress your poker buddies. Each chip bears an image of the iconic “Las Vegas” sign in the center of the chip. The word “Casino” is printed at the top of the chip, while the words, “Las Vegas, Nevada” are printed at the bottom. The rolling aluminum case is ideal for easily transporting your chip set…. 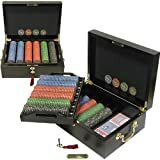 This Fat Cat Bling Texas poker chip set delivers everything you need to set the games up smoothly and keep them going professionally, so poker night at your house exudes an air of utmost authenticity. 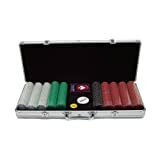 500 13.5-gram Claytec chips in lithographed denominations with the Bling logo include 150 white, 150 red, 100 blue, 50 green and 50 black, all housed in a lockable polished aluminum case with black felt lining and a sturdy carrying handle. Also included: 2 decks of cards, 5 poker dice and three game buttons: Big Blind, Little Blind and Dealer. These 14 gram Tri-Color Ace/King Clay Chips are 39 mm diameter casino-sized chips and are designed with an authentic soft clay look and texture. These chips have the soft feel of a clay surface which makes them the most authentic poker chip available on the home gaming market. Get these quality clay chips at a fraction of the cost of authentic casino clay chips. They are crafted of a solid clay-like substance, with an inconspicuous metal insert. These exclusive chips were created by the use of the latest technology to produce a heavy chip with the real sound and feel….